The Newberry County Courthouse is located at 1226 College Street in historic downtown Newberry. 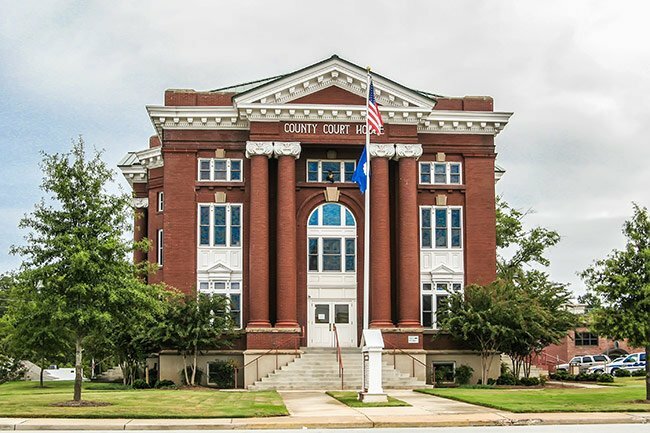 It was constructed in 1908 and is the fifth courthouse to serve Newberry County. 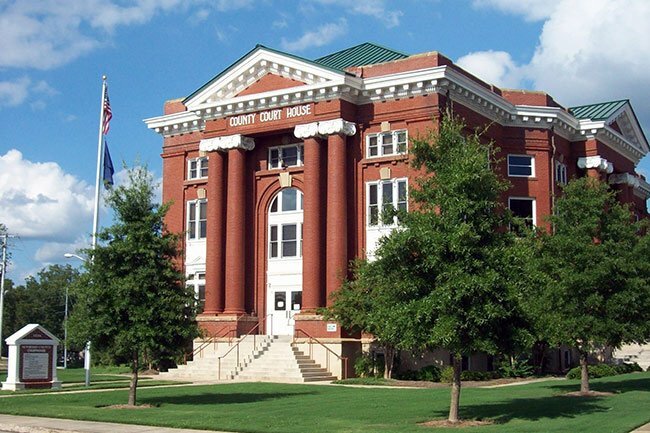 This courthouse was built to replace the old courthouse, which was constructed in 1852 and now serves as Newberry’s Community Hall and Chamber of Commerce. Made from red brick and terracotta, the current courthouse was designed in the neoclassical style by famed architect Frank Pierce Milburn. Milburn designed several other historic South Carolina buildings, including the South Carolina State House, the old Anderson County Courthouse, and the Gibbes Museum of Art in Charleston. The courthouse consists of three stories and a basement, and it is marked by Ionic brick columns at its entrance. The building was enlarged in 1938, with a rear addition designed by Columbia architect and Prosperity native Heyward Singley. Newberry County was one of six counties created in 1785 from the large district of Ninety-Six. The original plat shows the creation of a public square and by 1801 a small frame courthouse had replaced the first log structure, and the village began to grow up around the town square. Structures on the square include the fourth of five courthouses (ca. 1850) built for the County, the old Newberry Bank, Hotel, the Opera House, and the Confederate Memorial Monument. Three of the “new” buildings were designed by prominent architects: Frank P. Milburn designed the (fifth) Newberry County Courthouse, James Knox Taylor designed the old Newberry Post Office, and Reuben Harrison Hunt designed the Central Methodist Church. Is there any information on how the community of Jalapa came to be and what is the origin of the name Jalapa? The Fedeeral Census in 1870 listed the court house as homeless shelter. Where can I find the records for that listing? My great, great grandmother was 1 year old living at the courthouse. I need more info on her. Why was she placed there. Carrie Jones is her name and she was listed as a pauper. Help me, I need to know. Is there a paper trail?